The Royal Canadian Mint has been issuing the Canadian Silver Maple Leaf coins since 1988 under the authorization of the Canadian government. The Silver Maple Leaf is among the most highly valued silver bullion coins in the world, with a face value of five Canadian dollars. The coin weighs one ounce, and is 99.99 percent silver, which is higher than most other bullion issues which usually have 99.90 percent silver content. The market value of the Canadian Silver Maple Leaf can vary widely. For instance, in 2008, the value of the Canadian Silver Maple Leaf rose to $20, and in 2011, it was valued at just slightly more than $30. The pricing is always relavant to the spot price of silver, and Silver Maple Leafs typically sell in the retail market between $2 and $4 over spot per ounce, making them one of the more cost-efficient silver bullion coins out there. The coin has a maple leaf detail, thus the name. This coin is one of the world’s most recognized and beloved bullion coins. 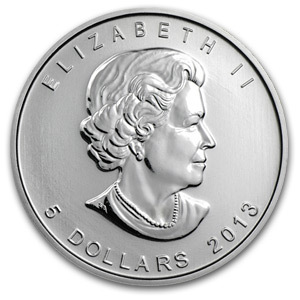 It is the official silver bullion coin of Canada, and is made with one troy ounce of silver. Some of the variations in the past for this coin have included privy marks, a proof release (in 1989 only), holographic enhancements, and a colored maple leaf in a design that differed from the traditional maple leaf design used in the series. There was also a 2009 issue that commemorated the Winter Olympics of 2010. One element that has remained the same throughout every issue of the Canadian Silver Maple Leaf coin from year to year is the wording ‘fine silver 1 oz Argent pur’ on the bottom of the coin’s reverse side. The current reverse of the coin was designed by Dora de Pedery-Hunt in 2009. The coin’s current obverse side, which features Queen Elizabeth III, was designed by Susanna Blunt in 2009. The effigy of the queen on the coin has undergone three different transformations, based on the age of the queen. There have been several other issues throughout the span of the series that are notable to collectors. In 1998, a single issue of the coin was produced in a ten-ounce version in order to mark the 10-year series anniversary. Some of the coins issued in 1999, but not all, were given a privy mark in order to commemorate the Maple Leaf Program’s 20-year anniversary. In 2000, coins in the series were given a fireworks privy mark while another coin was issued to commemorate the turning of the millennium. These coins were double-dated. Silver Maple Leaf coins differ from other coins produced in the Maple Leaf program because their high demand among collectors can cause them to sell for far more than the bullion value of the coin itself. Two coins in particular have garnered high collectible value due to their low mintage: 1996 and 1997 issues. In 1997, for example, just more than 100K coins were minted. When compared to the record of 17.8 million coins in 2010, it is easy to see how the 1997 coin would be considered more collectible. Canadian Silver Maple Leafs are packaged in yellow-topped tubes of 25 coins, which are encased in yellow 500-coin Monster Boxes. Investors can purchase Maple Leafs by the tube or Monster Boxes at a discount vs. individual coin pricing. Once you have the Maple Leafs in your possession we recommend handling them carefully, as the oil from your skin can over time cause them to have white, milky spots.